The Physical Education Department at the Maynard School believes that PE should provide every student, through a broad range of physical experience, access to the skills, knowledge, understanding and attitudes necessary to promote life-long participation in physical activity. To promote positive attitudes to participation in physical activity and to allow students to make informed decisions about the importance of exercise and life-long physical activity. To provide opportunities for students to select and apply skills, tactics and compositional ideas to suit activities which require different approaches and ways of thinking. To increase understanding and promotion of safety factors specific to individual activities. To allow students to understand what it means to face challenge, persevere and deal with success and disappointment graciously. We seek to ensure that provision contains a balance of individual and group activities, of both a co-operative and competitive nature. 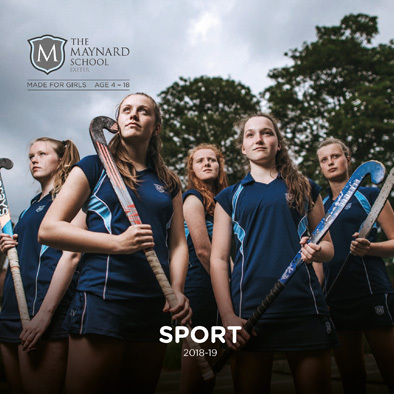 At Maynard, sport and extra-curricular clubs are at the heart of school life. The department aims to provide an extension of the skills experienced in Physical Education with a complementary variety of sport and aesthetic activity. Through this we aim to promote excellence, competition and enjoyment in active participation. Extra-curricular clubs and practices take place during lunchtime and after school. All teams and clubs are co-ordinated and organised by specialist Physical Education staff with assistance from sixth form students, other staff and coaches. PE is a popular option at GCSE. The emphasis is on encouraging girls to take more responsibility for their own fitness and hopefully build habits for life. Winter, Spring and Summer programmes of work are offered, in which girls choose which sports they will focus on. We also provide opportunities to follow the Sports Leaders Award.